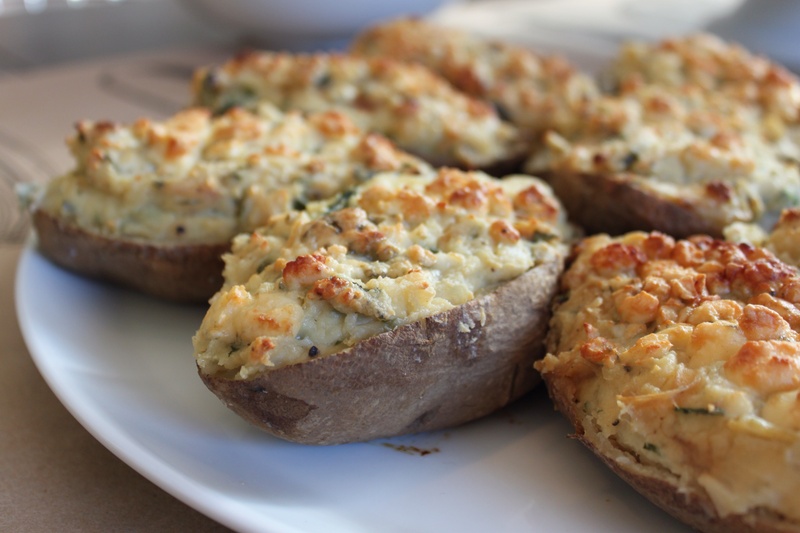 I love twice-baked potatoes as a make-ahead item for parties. I could never host a Monday night dinner party without some advance preparation. And, you can make all kinds of twists with twice baked potatoes – spring pea, bacon, blue cheese, you name it! Make everything in ahead and heat them at 350 until warm. Easy, as, that! Pierce potatoes with a fork; arrange on paper towels in microwave oven. Microwave at high 10 minutes or until done, rearranging potatoes after 5 minutes. Let stand 5 minutes. Meanwhile, melt butter in a medium nonstick skillet over medium heat. Add onion and sugar; sauté until browned (be patient, this will take a long time). Cut each potato in half lengthwise; scoop out pulp, leaving a 1/4-inch-thick shell. Combine potato pulp, onions, sour cream, salt, and pepper. Spoon potato mixture evenly into shells. Top with cheese. Return potatoes to the oven and broil until toasted!